The Rancho Cordova Police Department Traffic Unit will be conducting a DUI/drivers license checkpoint on April 27, 2012. The check will be conducted at an undisclosed location within the city limits between the hours of 7:00 pm and 2:00 am. “Over the course of the past three years, DUI collisions have claimed 2 lives and resulted in 39 injury crashes harming 56 of our friends and neighbors,” said Sgt. Lane of the Rancho Cordova Police Department Traffic Unit. 1 comment to ''DUI Checkpoint This Weekend in Rancho Cordova"
Police officers conducting DUI checkpoints have strict compliance of the charges given to the suspected DUI. Penalties and charges are base on the evidence they get. 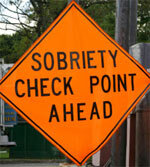 You need the help of DUI lawyer to minimize charges filed against you.